Knowing how to deal with puncture wounds after an attack by either a domestic or wild predator will play an essential role in saving your animal. 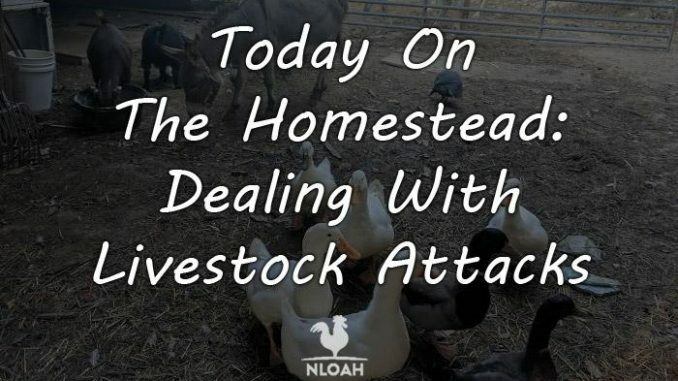 Both my husband and I have had extensive first aid training and practice; I highly recommend learning both human and livestock first aid to every homesteading family. 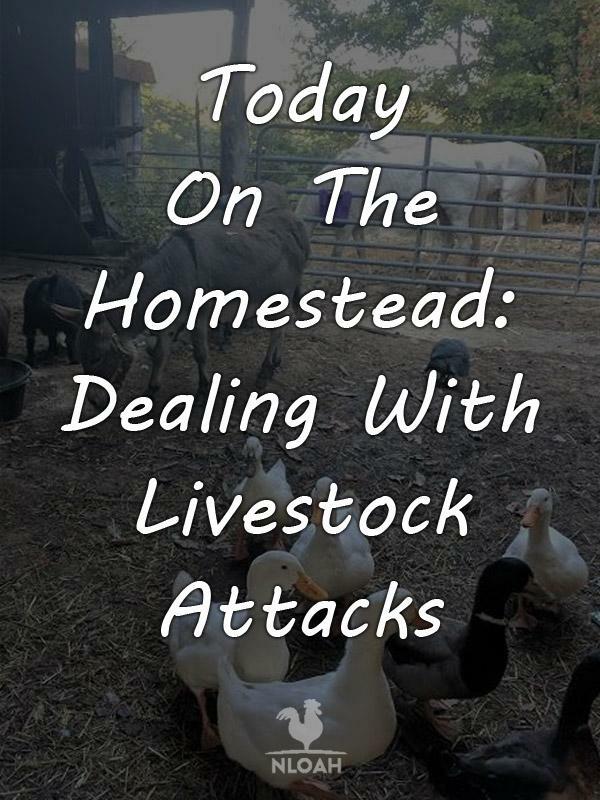 Accidents and attacks happen to both humans and animals on a homestead. Knowing how to quickly react to them can make a life or death difference in many cases. 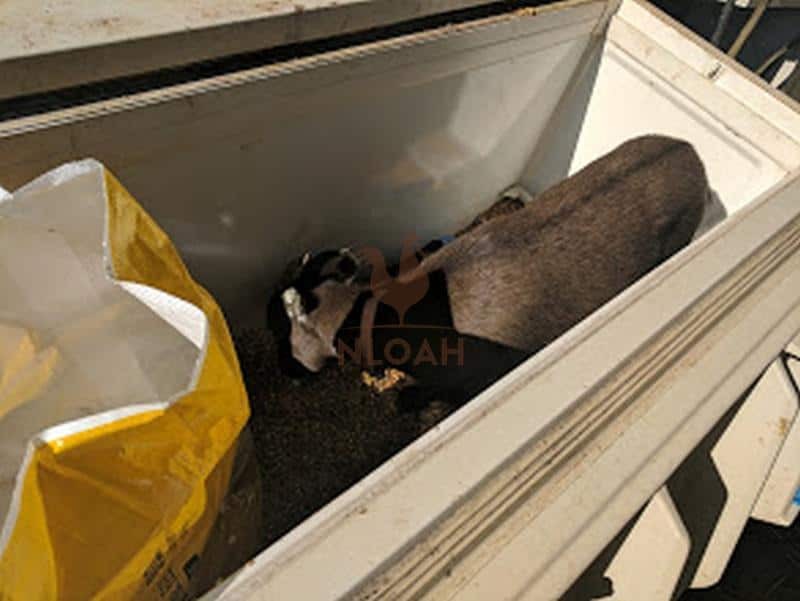 For the past two weeks on the homestead we have been trying to save Pearl, our Nigerian Dwarf goat, after she was the victim of a dog attack. I am happy to report she is alive and thriving – but must now face surgery to remove her injured leg. 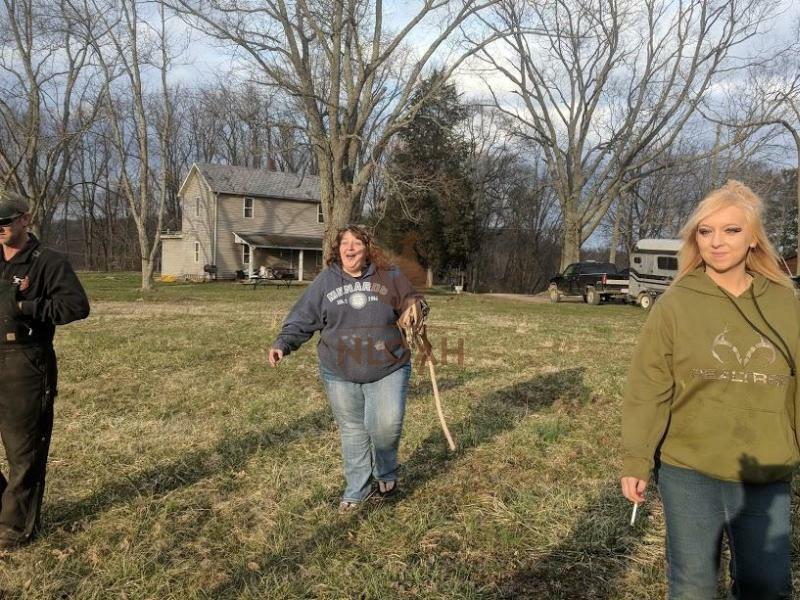 When I had to beat an attacking dog on the head and back repeatedly to get her off of my goat, I had not only a wood handled pitchfork handy in my barn to do it with, an emergency first aid kit that included a quick clotting bandage, and two guns to use if necessary to stop the attack. I carry a handgun in my barn bag and a rifle in a scabbard on both the 4-wheeler and my saddle. My .22 Lever Action Henry rifle is always on my 4-wheeler. I tend to carry something more powerful that also has a scope when riding my horse in the deep woods. The chances of my Henry, as much as I love it, would not the best firearms choice when dealing with the wild boar that roam in my region. I was a good athlete and coached for many years, I know how to swing a bat with force. If my dog had not jumped in when I almost got bit when I had no choice but to grab on the collar of the attacking dog, I wouldn’t have gotten her off. I was more than willing to shoot the dog, but they were tussling around to much to get a clear shot. Hesitating to shoot one living thing in order to protect another is not a mistake I would make, but doing so safely in this instance was simply not an option. I had hoped against hope that the leg which sustained three dog bite puncture wounds would eventually heal and be well enough to put weight on again. It can take weeks or months for injured tendons to heal, and that is what we had our fingers crossed was happening, but unfortunately we were wrong. Once the massive swelling that emerged in Pearl’s leg, shoulder, and chest, stretched her already torn hide so far that is separated from the rest of the leg, we quickly saw that the dog attack had completely severed all of the tendons in the leg. We used a scalpel to cut away the rotting hide. This is a stomach churning thing to do, but is a necessary step in preventing even more hide loss or a return of infection to still healing puncture wounds. It takes at least two, but preferably three people to complete such a task on medium livestock. You have to hold the animal completely still, which can take two people, and a third to cut away the rotting flesh. 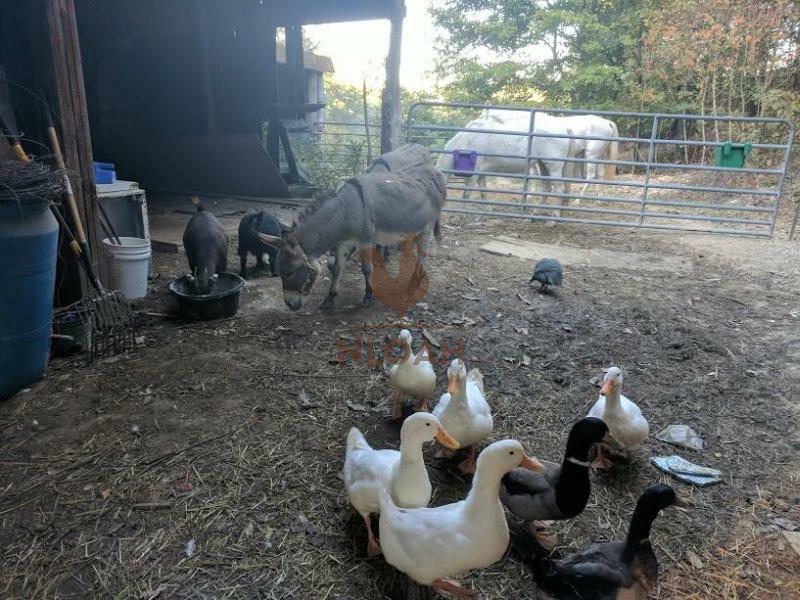 Pearl loves to hop down into the feed tub as soon as it is opened, so she is the first one to get breakfast every morning. In this photo, she still had two ears and four good legs when she jumped into the old refrigerator that is now garnering a second life as a feed tub. Clean the exposed skin underneath before cutting with peroxide or something similar, so you have a clear and in-depth view of what is going on below the rotting. If you have never smelled rotting flesh before, prepare yourself for the stench and do not have anyone help you with this task who has a weak stomach or cannot handle the site of blood and gore. In Pearl’s case, the cutting was simple and easy because we did not have to work delicately around tendons or muscles that were still intact. If you are faced with muscles, tendons, and ligaments that can be saved, you should either call the vet and let them take care of the animal or cut the rotting skin away in smaller sections to avoid doing further damage to a leg that can be saved. Pearl stood completely still and munched on bits of bread while we quickly cut away the rotting skin. There is no pain involved in the cutting. Removing the hide will also protect the animal from snagging it on something and ripping away healthy skin it is attached to or tearing tendons, etc. The hide on Pearl’s injured leg looked completely normal ,just swollen, until it separated overnight on Friday. We checked her leg for swelling multiple times per day and were thrilled because it continued to go down until it was essentially back to normal. But it was the tell tale smell of rotting flesh they kept us concerned. When Pearl’s puncture wounds slowly healed, I breathed a big sigh of relief that she was going to live, but remained diligent about the leg she would not put any weight on or move freely when it remained raised. Once the rotting flesh was cut away, I put some of my Papaw’s miracle healing salve onto the thin and tender skin and wrapped it with gauze. I had to force myself not to use the awesome homemade healing salve immediately after the dog attack, except on Pearl’s ear. The 1 part turpentine and 3 parts petroleum jelly salve heals even deep wounds in record time, in my personal experience. But, that is the exact opposite of what you want to happen with a puncture wound that occured because of a bite from a dog or other predator. Puncture wounds, especially from dog bites, create receptive pockets for infection growth. This makes treating and covering them to prevent debris (and manure) from getting into them, far more difficult. If such wounds close before the infection dissipates, it will essentially be sealed inside the body, fester, and cause substantially more damage…or quite possibly even death. They do, however, need cleaning and air getting to them. I did put a natural infection pulling poultice on Pearl every night and wrapped it to the leg, but removed and cleaned the wounds again each following morning. She remains on penicillin shots and we also gave Pearl a tetanus shot after the dog attack – we did not know how long (if ever) it has been since she had been given a tetanus shot before we rescued her, so the vet prescribed another one. You can buy penicillin over the counter at Tractor Supply and similar stores for a nominal fee. Right now, Pearl is running, jumping, walking, and even climbing on three legs. She is blissfully unaware that I am waiting on a call from the vet to get her surgery scheduled. If you watch her from a distance, you would not even be able to tell she just went through a traumatic, bloody, and potentially dog attack. But, once she comes closer, it is immediately apparent that her left ear is completely gone and she is holding up her right front leg and not using it at all. Pearl will likely have several days to a week of learning how to balance her body and get around easily after her surgery. If she adapts as quickly to having only three legs as she has using only one ear, she will be raising her kid, Rooster, up the hill behind the pond again in no time. We helped a nice young couple that grew up in our hometown to find a forever home for a horse they inherited. Our cousin, Bonnie Sue, had ridden since before she could walk. Then, two years ago, she suffered a freak ankle and foot fracture that the big city doctor she had to see for multiple surgeries, said was the worst break he had ever seen. Bonnie Sue is a farm girl born and bred, sitting on a couch for three months and using a scooter to get around after the first few surgeries was heck on earth for her. Then she graduated to a walker, and a few more surgeries. Finally, she is walking free of a cane and on her own, but still cannot handle uneven ground – which we have a lot of out here in the country. She never thought she would be able to ride again, something that those of us who love this sweet lady, found heartbreaking. Less than an hour before the young couple called and asked for my help finding a new home for the horse, Bonnie Sue texted to ask me if she could come take my Ruby out for a spin one day soon, saying she was finally ready to ride again. I considered the timing of the phone calls fate and took her to meet the horse. I am not sure you can tell there are tears of joy in her eyes in the photo, but it was love at first sight for our cousin and Pete. 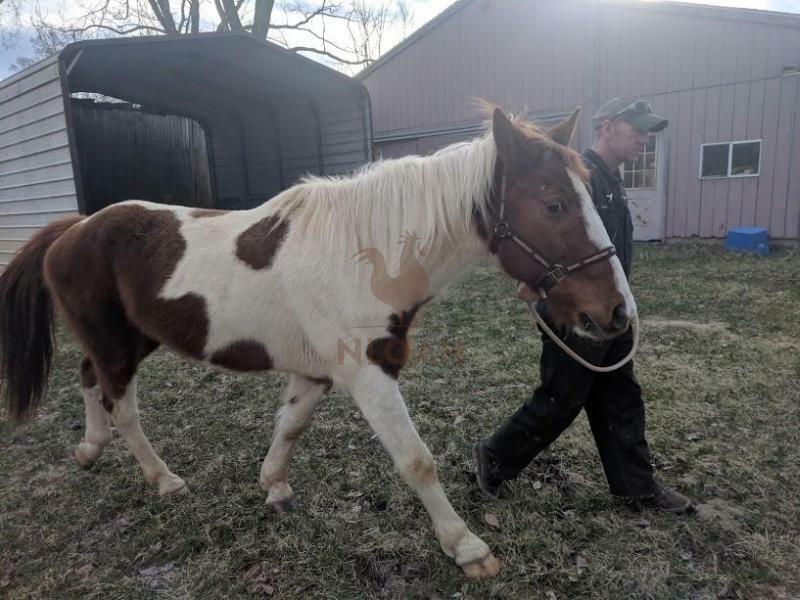 My Bobby and several friends are going to make what amounts to a doubly wide step ladder so she can walk up and sit on the saddle and then swing her bad leg, the left one, over and into a stirrup. We have also had some hilarious weirdness going on in the barnyard this week. 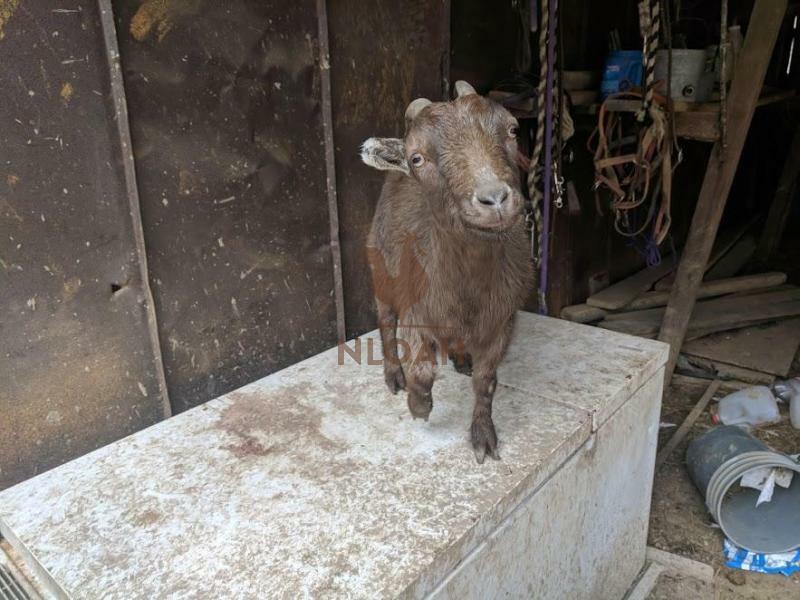 Not Negan, a Pygmy goat that is Pearl’s mate, suddenly seems to think he is a horse. He walks right next to or sometimes under my Ruby and spends the entire day walking around in the upper pasture with the rest of the herd. Watching that tiny little goat running as fast as his little legs can carry him to keep up with Ruby, is a hilarious sight to behold. I also have a duck that now thinks it’s a goat. Baby Duck, a full grown female, was born with some feet issues. Her feet turn inward and she is slightly bow legged. Even though I have an equal number of males and females in duck flock, all of the drakes still pile onto baby duck. Two drakes hop on her back at a time or one drake mounts her and the other pecks at her feathers from the side. Poor Baby Duck hardly has any feathers left on her head or neck. Since she isn’t as fast as the other hens, her lot in life did not improve when I locked them up in the coop at night after a day of free ranging. Baby Duck is the cutie in the back left of the photo. Baby Duck follows me around the barnyard even more than the rest of the critters, so when I walked into Pearl’s stall to put her up for the night (she is free ranging during the day but going up at night because she is just too vulnerable to predators right now, she isn’t as quick as she used to be even though she is moving around very well) the duck followed me in as well. Baby Duck didn’t want to leave and go to coop for put up, so I let her have a sleepover with Pearl and Rooster. I knew she would not be really protected in the stall, but she was not going to be safe in the coop with all of the drakes either. I was not sure what I would find when I opened the stall after the first sleepover, but Baby Duck survived the night just fine and has gone back every night since. The chickens and guineas roost in the top of the barn, since they staged a coop coup a few months back, and I have not lost a single one to a night time predator. 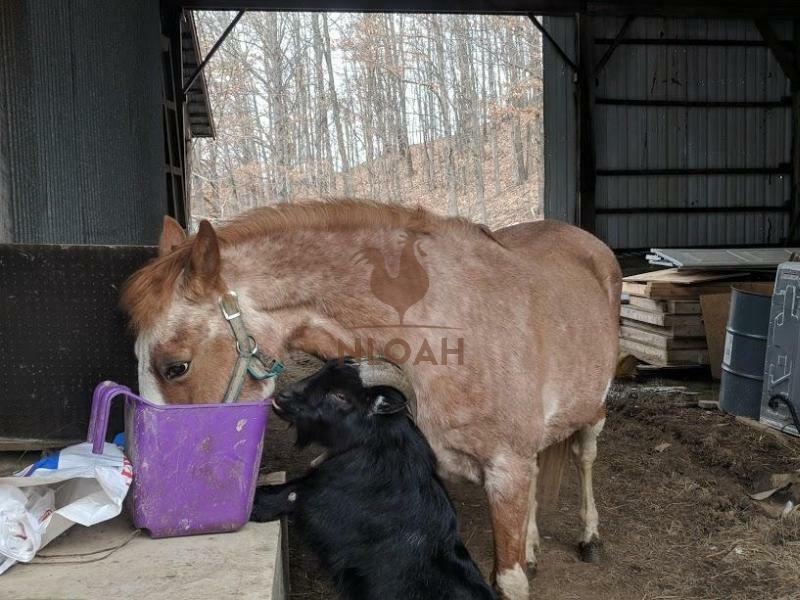 With all of the goats, horses, and miniature donkeys in the barn too, predators have plenty of incentive to stay away. I love that our barnyard lives in such great harmony together. 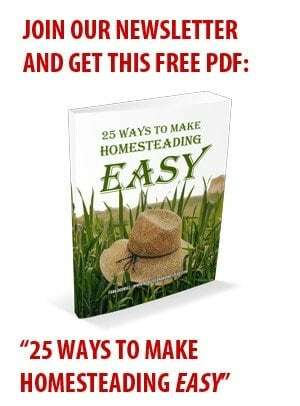 How were things this week on your homestead?